When you hear the term ‘high-efficiency air filter’ what do you think? Like most people, you probably think of hard-working filters that can improve the air you breathe, and that’s true. But do you understand how a filter achieves high-efficiency? Or what that phrase even means? This is important because without understanding the basic standards of air filter efficiency, you won’t understand how to shop for the best filters, or what the terminology companies often use really means. With that in mind, let’s look at how high-efficiency filters are measured, and why they are so important in the fight to improve indoor air quality. Explaining the Minimum Efficiency Reporting Value (MERV) standard is a good place to start because this is the standard established by the American Society of Heating Refrigeration and Air Conditioning Engineers (ASHRAE), which oversees the air filtration industry. According to the National Air Filtration Association (NAFA), MERV is based on a scale from 1 to 16 and measures an air filter’s capacity to trap particles from the air based on three different size ranges. The problem with the MERV standard is that the measurements don’t follow strict logic. For example, you would assume that an air filter rated a MERV 8 would capture 50 percent of all airborne particles, but a MERV-8 filter is only rated to trap about five percent of harmful particles. That’s because the 16-point scale doesn’t work in exact accordance with logical percentages, so it’s difficult for consumers to know just how efficient their air filters are based on the MERV point system. This confusion regarding MERV is not the only reason air filter efficiency ratings are difficult to understand. Another reason is that the U.S. is on a different standard than countries in Europe, which means consumers cannot make valid comparisons about air filter efficiency. That’s why the new ISO 16890 Standard changes the game for consumers and manufacturers of air filters. It levels the playing field so that consumers can now judge every air filter manufacturer based on the same set of standards throughout the world. According to the Centers for Disease Control (CDC), PM is created from a variety of sources such as vehicle exhaust emissions, power plant emissions, coal-burning and wood stoves. (3) Long-term exposure to PM has been linked to eye irritation, difficulty breathing, lung cancer, and heart disease. The new standard measures how well air filters trap PM10, PM2.5 and PM1 levels, so unlike previous standards, there are only three size ranges and three pollutants being measured. The 10, 2.5 and 1 designations refer to the diameter of particulate matter in micrometers, and these three sizes are the most harmful because their microscopic size makes them easy to swallow or inhale. The fact that high-efficiency air filters are now being measured based on PM is important because these pollutants pose the biggest risk to human health. Checking the U.S. Environmental Protection Agency (EPA) Air Quality Index – this is a daily listing that tells you the air quality in your area, and how harmful it could be, especially to people with respiratory problems such as asthma. Limit outdoor activities on days when PM levels are elevated. Invest in high-efficiency air filters using the ISO Standard to ensure you are removing the most harmful particles of concern. For more than 50 years, Camfil has been the industry leader in commercial air filtration, and with that leadership comes a desire to ensure that efficiency standards continue to evolve. 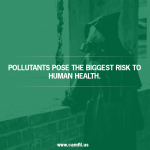 Camfil’s driving principle is providing quality at an affordable price, and the company’s guiding principle is that clean air should be every human’s right. The post How A High-Efficiency Air Filter Could Save Your Life appeared first on Submit123PR | Press Release Service.